Arrive Delhi by Air or Train. Arrive at bus stand, Travel over night in Volvo bus from Delhi to Manali. Rohtang pass(up to possible) which is located at height of 13050 Feet from sea level, Generally Rohtang pass open in mid May and closes in mid November, depending up on snowfall, If Rohtang pass is not open sight seeing will be done for available snow point like Gulaba , Kothi or Marhi or Solang valley. Solang valley is heaven for adventure lovers, and Paragliding . zorbing, skiing can be done, return back to hotel & overnight stay at Manali hotel. 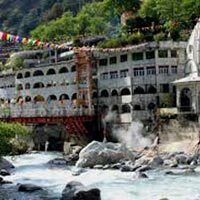 After Breakfast in the Morning excursion to Kullu valley, enjoy Rafting in the Beas River, enroute visit Kullu market, Kullu Shawl factories and sale outlets, Angora Farm, Vaishno Mata Temple and Parvati River. 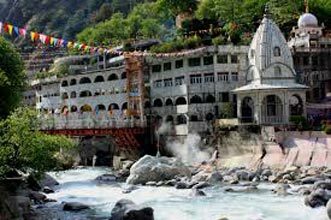 Kasol Valley, Manikaran Shiva Temple, Gurudwara Sahib and Hot water springs, return back to hotel & overnight stay at Manali hotel. In the morning, you would check out from the hotel. You can explore the Shopping malls of Manali on your own. In the evening board the Volvo AC bus to Delhi for overnight journey.